Primary Natural Resources nickel, gold, silver. THE DOMINICAN REPUBLIC, which sits on the western portion of the island of Hispaniola in the CARIBBEAN SEA, was once covered with lush rainforests full of thousands of flora and fauna species throughout its steep mountains and deep valleys. However, this country has faced hundreds of years of deforestation, and many of the swamps were drained. Because of its tropical maritime climate, frequent rainstorms send topsoil into the ocean, and a barren landscape has been created. The top soil deposits in the ocean have also destroyed marine coral reefs. But portions of the countryside have retained their beauty with different trees and over 218 bird species. In the surrounding waters, humpback whales gather, and sea turtles, manatees, and pilot whales dominate the marine life. The island of Hispaniola was founded by Christopher Columbus in 1492 and ultimately became a permanent Spanish settlement. 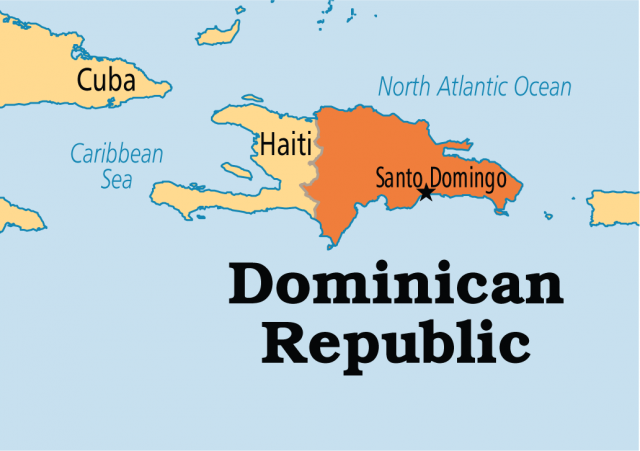 After years of oppression and unrest, an independent Dominican Republic was created in 1844. For 25 years after independence, the Dominican Republic was ravaged in a leadership conflict between General Pedro Santana and General Buenaventura Báez and their armies. In 1882, General Ulysses Heureux rose to power and, until his assassination in 1899, mismanaged the nation’s affairs. He violently repressed any opponents and poorly managed the economy. By the end of the 19th century, the Dominican Republic’s economy had progressed to an agriculturally driven one. Tobacco and coffee became two of the main crops. After Heureux’s death, the sugar industry was revived and American businessmen began to invest in the plantations. In 1916, U.S. military forces were sent to the Dominican Republic. For eight years, these forces occupied the country, disbanded the Dominican army, and remodeled the legal system. The military also trained local militias. By 1924, the American military had left the Dominican Republic with Raphael Leonidas Trujillo in charge of the army. Six years later, Trujillo gained complete power of the government. Trujillo enforced a very repressive dictatorship. His followers wreaked havoc against political opponents, even reverting to assassinations. However, he maintained positive relations with the UNITED STATES, by offering favorable conditions to American companies, and not supporting communism. However, in the 1950s, Trujillo’s power base slowly began to crumble, and his relations with the United States suffered. One year after being connected to an assassination attempt against the Venezuelan president, Trujillo himself was assassinated. For the following four years, the Dominican Republic teetered on the edge of a socialist state. In 1965, President Lyndon B. Johnson called on the U.S. military to once again enter the country, and restore order. One year later, Dr. Joachim Ballaguer, a former Trujillo lieutenant, was elected president in an allegedly corrupt election. He remained in power for 12 years, and then after a tumultuous election was replaced by Antonio Guzmán of the Dominican Revolutionary Party. In 1982, Guzmán committed suicide and was replaced by Salvadore Blanco. However, corruption led to his downfall and eventual imprisonment. Ballaguer was again voted in to office in 1986. A public works reconstruction program was implemented, but by 1988, the country suffered a two-year recession. In June 1989, massive demonstrations were held in protest of the economic difficulties and lack of basic resources such as water and electricity. Balaguer instituted a second series of economic reforms, which included balancing the budget and limiting inflation. These measures were overall successful, and economic growth continued through the decade. In June 1996, Leonel Fernandez Reyna was elected president. He continued the economic reforms but was not reelected in 2000. Hipólito Mejía from the Revolutionary Democratic Party was voted in as president. The economic reforms continue in the country and the country is slowly beginning to prosper.